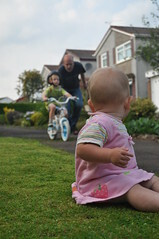 Daddy keeps running around pushing Léon on his bike. Pudge used to do it himself but then Daddy took the little wheels off so he could run after him. It doesn't seem very sensible to me. Especially when Pudge keeps falling off! I'm not sure I get adults!